This is the first part of the tutorial where we will actually get to draw something! In this lesson you will learn to draw a triangle on the screen. We will build this triangle by creating a series of vertices and having the hardware draw them on the screen. This takes a lot of code. I won't pretend that rendering a triangle is as quick as going full screen, but it certainly will make sense in the end, and things will get easier as we go on. In the meantime, let's dive right in. 1. First, we tell the GPU how it is to go about rendering our geometry. 2. Second, we create the three vertices of our triangle. 3. Third, we store these vertices in video memory. 4. Fourth, we tell the GPU how to read these vertices. 5. Fifth, we finally render the triangle. Let's start out by discussing the first step, telling the GPU how to go about rendering our triangle. The process of rendering is controlled by the rendering pipeline. If you remember back to Lesson 1, you will recall that the rendering pipeline is a series of steps which result in a rendered image. Unfortunately, the pipeline does not automatically know what to do. It must first be programmed, and it is programmed by shaders. 1. Load and compile the the two shaders from the .shader file. 2. Encapsulate both shaders into shader objects. 3. Set both shaders to be the active shaders. 1. Load and compile the two shaders from the .shader file. In this first part, we are going to compile two shaders. These are the vertex shader and the pixel shader, the two shaders that are required for rendering. 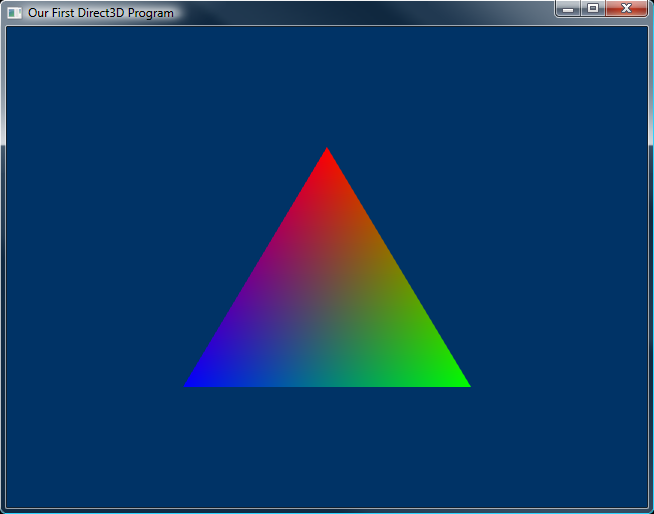 To load and compile a shader, we use a function called D3DX11CompileFromFile(). This function has a large number of parameters, a surprising number of which we can set to 0 and ignore until later. I'm going to walk through all the parameters, but ignore the ones labelled "advanced". This first parameter is the name of the file containing the uncompiled shader code. For us, this is going to be L"shaders.shader". Shaders are typically stored in files with the extention .shader, though you can use any extension you like. This parameter is the name of the shader. In the code, each shader will start with a specific function, and that is considered the name of that shader. In this lesson, the example shaders will be called VShader and PShader. where "v" stands for vertex, "s" stands for shader, and "_4_0" stands for HLSL version 4.0. You can replace the "v" with a "p" for pixel shader. The first time we call this function we'll use "vs_4_0" and the second time we'll use "ps_4_0". This parameter is a pointer to a blob object. This blob object will be filled with the compiled code of the shader. A blob object is a neat little COM object that stores a buffer of data. We can use the functions GetBufferPointer() and GetBufferSize() to access the contents. We'll see an example of this below. So what does this do exactly? For the vertex shader, it loads the contents of "shaders.shader", finds the function "VShader", compiles it as a version 4.0 vertex shader, and stores the compiled result in the blob VS.
That said, let's find out what we can do with this compiled code. There are four parameters here, three of which are obvious. The first is the address of the compiled data. The second is the size of the file data. The fourth is the address of the shader object. The third is advanced and will be covered later. For these functions, the first parameter is the address of the shader object to set, while the othe two objects are advanced and will be covered later. Remember that pVS and pPS are both COM objects, so they must be released. In summary, this function prepares our GPU for rendering. It has been given all the instructions it needs to turn vertices into a rendered image. Now all we need are some vertices. As you can see, we have three floats representing the position, and one representing the color. When creating a struct in C++ the data is stored in system memory, but we need it to be in video memory, which we don't have easy access to. In order to allow us access to the video memory, Direct3D provides us with a specfic COM object that will let us maintain a buffer in both system and video memory. This is a struct containing properties of the buffer. As with many Direct3D structs, we need to initialize it by zeroing it out. Buffers are set up to be as efficient as possible. To do this correctly, Direct3D needs to know how we intend to access it. This table shows the various flags that can be used here. We'll be using dynamic usage for this tutorial. This value contains the size of the buffer that will be created. This is the same size as the array of vertices we intend to put into it. For this lesson, we get this by calculating: sizeof(VERTEX) * 3. This member adds clarification to the usage flags, by telling Direct3D how we plan to access the CPU. The only flags here are D3D11_CPU_ACCESS_WRITE and D3D11_CPU_ACCESS_READ, and they can only be used in alignment with Table 2.1. We will use D3D11_CPU_ACCESS_WRITE, because we want to copy data from system memory into the buffer. The function that creates the buffer. The first parameter is the address of the description struct. The second parameter can be used to initialize the buffer with certain data upon creation, but we've set it to NULL here. The third parameter is the address of the buffer object. Here, pVBuffer means pointer to vertex buffer. So we now have some vertices for a triangle, and we have a vertex buffer to place them in. Now all we need to do is copy the vertices into the buffer. However, because Direct3D may be working with a buffer in the background, it never gives you direct CPU access to it. In order to access it, the buffer must be mapped. This means that Direct3D allows anything being done to the buffer to finish, then blocks the GPU from working with the buffer until it is unmapped. 1. Map the vertex buffer (and thereby obtain the buffer's location). 2. Copy the data to the buffer (using memcpy()). This is a struct which will be filled with information about the buffer once we've mapped it. This information will include a pointer to the buffer's location, and we can access this pointer using "ms.pData". The next line maps the buffer, allowing us to access it. The parameters are pretty easy. The first one is the address of the buffer object. Our buffer pointer is called pVBuffer, so use that. The second one is advanced. We'll get to it later. Fortunately, we can set it to NULL for now. The third parameter is a set of flags that allows us to control the CPUs access to the buffer while it's mapped. We are going to use D3D11_MAP_WRITE_DISCARD, but the others can be found in this table. D3D11_MAP_READ Buffer can only be read by the CPU. DXD11_MAP_WRITE Buffer can only be written to by the CPU. DXD11_MAP_READ_WRITE Buffer can be read and written to by the CPU. DXD11_MAP_WRITE_DISCARD Previous contents of buffer are erased, and new buffer is opened for writing. DXD11_MAP_WRITE_NO_OVERWRITE An advanced flag that allows you to add more data to the buffer even while the GPU is using parts. However, you must not work with the parts the GPU is using. The fourth parameter is another flag. It can be NULL or D3D11_MAP_FLAG_DO_NOT_WAIT. This flag forces the program to continue, even if the GPU is still working with the buffer. The last parameter is the address of a D3D11_MAPPED_SUBRESOURCE struct. The function fills out the struct we designate here, giving us the info we need. Next, we do a standard memcpy(). We use ms.pData as the destination, OurVertices (or whatever) as the source, and sizeof(OurVertices) as the size. Last, we unmap the buffer. This reallows the GPU access to the buffer, and reblocks the CPU. The first parameter is the buffer (pVBuffer), and the second parameter is advanced (NULL). B) created a shape using vertices and readied them for the GPU to use. You may be wondering how the GPU is capable of reading our vertices, when we placed them in our own, self-created struct. How can it know that we placed location before color? How can it know we didn't mean something else? A vertex layout consists of one or more input elements. An input element is one property of the vertex, such as position or color. Each element is defined by a struct, called D3D11_INPUT_ELEMENT_DESC. This struct describes a single vertex property. To create a vertex with multiple properties, we just put these structs into an array. There are seven values in this struct. The first value is called the semantic. A semantic is a string which tells the GPU what the value is used for. This table shows a few semantic values, and we'll take up more as we go on. The second value is the semantic index. If we had a vertex that had two colors, they would both use the COLOR semantic. To avoid confusion, we would have each property have a different number here. The third value is the format of the data. On many semantics, the number of values is arbitrary (so long as its less than four). All that matters is that the format matches what you use in your vertices. The fourth value is called the input slot. This is advanced, and we'll cover it later. For now, it should be 0. The sixth value is what the element is used as. There are two possible flags here, but the one we are interested in is D3D11_INPUT_PER_VERTEX_DATA. We'll cover the other flag later. The last value is not used with the D3D11_INPUT_PER_VERTEX_DATA flag, so we'll have it be 0. This is the last thing before we get to start drawing. I promise. Here, we call CreateInputLayout(), and thus create an object representing the vertex format. Let's look at the prototype for the function before we discuss it. This is actually one of the easier functions in Direct3D, despite its appearance. This first parameter is a pointer to the element description array. We'll put &ied here. Pretty self-explanatory, this parameter is the number of elements in the array. For us this is 2. Whoa! This is the pointer to the first shader in the pipeline, which is the vertex shader. This means we put 'VS->GetBufferPointer()' here. This is the length of the shader file. We can just put 'VS->GetBufferSize()' here. This is the pointer to the input layout object. We might as well call it something simple, like 'pLayout', so we'll put '&pLayout' here. Of course, to run this function, we'll need access to VSFile and VSSize, so we'll place this code right in the InitPipeline() function. One last thing before we move on. Creating the input layout does nothing until it has been set. To set the input layout we call the IASetInputLayout() function. Its only parameter is the input layout object. Now let's actually draw something! There are three simple functions that we have call to do rendering. The first one sets which vertex buffer we intend to use. The second sets which type of primitive we intend to use (such as triangle lists, line strips, etc.) The third actually draws the shape. The third parameter is a pointer to an array of vertex buffers. We only have one, so we can fill this with &pVBuffer. Now let's take a look at the entire render_frame() function now that we have modified it. Shaders are mini-programs which are used to direct the GPU in rendering. Rendering is impossible without shaders. In the first section, we loaded two shaders and loaded them up to the GPU. 2. Created objects for each one. 3. Set the two objects. 1. Created three vertices with both position and color. 3. Copied the vertices into the vertex buffer by mapping it, copying the data, and unmapping it. 1. Created input element descriptions for the position and the color. 2. Created an input layout object using the shader information. 3. Set the input layout object. 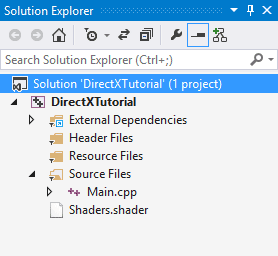 Before you build and run this program, you will need the shader file itself. It is called "Shaders.shader", and the contents can be found where it says "Show Shaders" below. At this point, you won't necessarily understand the shader code. We'll be covering it in detail in the next tutorial. Let's examine the final DirectX code. The new parts covered in this lesson are in bold as usual. 3. How do input layouts make vertex buffers more efficient? 1. Change the colors and shape of the triangle. 2. In earlier lessons, changing the viewport did nothing. See what it does now.